Fig. 3. Clarence Dennis with the first heart-lung machine at the University of Minnesota. called, was a bright (he completed his master's and doctoral degrees during this time also) and impulsive maverick, always pushing to the next level of care for his clinical patients, for whom he had great empathy. Lillehei and his team launched many surgical innovations during this period, primarily because of their hands-on research experiences in the experimental dog laboratories. Interestingly, prior to 1950, the heart was considered the core of human emotion, with a role in human feelings toward others and even the soul itself. 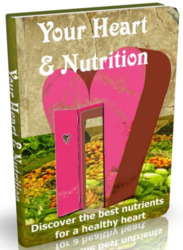 It was not until the medical profession began to view the heart more physiologically, as a pump or machine within the body, that researchers and clinicians began to develop new ways to repair and replace worn-out parts of the heart; innovations in the field of cardiac surgery then flourished (Table 2). Such innovation became prominent at the University of Minnesota. 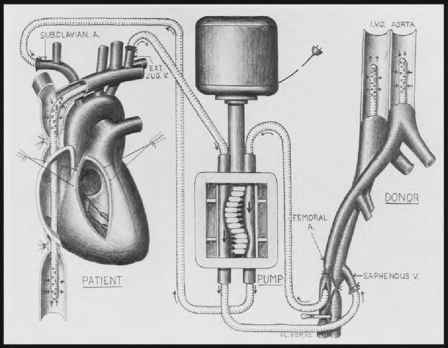 Soon thereafter, Dr. Clarence Dennis designed the first heart-lung machine for total cardiopulmonary bypass, which was subsequently tested successfully on dogs (Fig. 3). 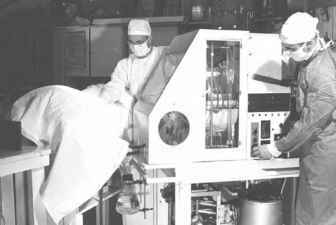 However, when Dennis and his team used the heart-lung machine in the clinical area for the first time on April 5, 1951, the patient died because of complications. A second patient also died during surgery from massive air embolism. Not long after, Dr. Dennis moved his machine and most of his team to New York City (1). 1988 HDI/Pulse Wave® profiler founded (Hypertension Diagnostics Inc. [St. Paul, MN], Jay Cohn, Stanley Finkelstein). The next major University of Minnesota (worldwide) milestone in cardiac surgery was the first open heart surgery using hypothermia on September 2, 1952, by Dr. F. John Lewis (Fig. 4). This procedure, suggested by Dr. W.G. Bigelow of Toronto, lowered the body temperature of patients 12-15° to reduce their blood flow, thereby reducing the body's need for oxygen. Brain cells would die after 3-4 min at normal temperature without oxygen, but hypothermia allowed Dr. Lewis and his university research team (Drs. Mansur Taufic, C. Walton Lillehei, and Richard Varco) to successfully complete a 5.5-min repair of the atrial septum on a 5-year-old patient. This was recognized as a landmark in the history of cardiac surgery; until this time, no surgeon had succeeded in opening the heart to perform intracardiac repair under direct vision. Hypothermia with inflow stasis proved to be excellent for some of the simpler surgical repairs, but it was inadequate for more extensive cardiac procedures. "The basic problem was the lack of any means to rewarm a cold, nonbeating heart" (2). Fig. 4. 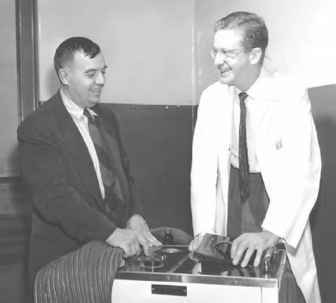 In this 1952 photo, Richard L. Varco (left) and F. John Lewis stand behind the hypothermia machine that they used during the world's first successful open heart surgery. Fig. 5. 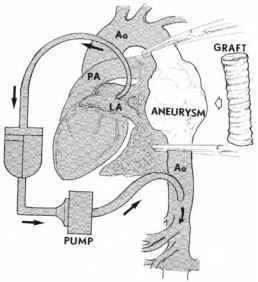 Diagram of cross-circulation. little excitement or enthusiasm among cardiologists and cardiac surgeons at that time, likely because other centers had launched their own experiments with bubble oxygenators. Interestingly, Gibbon was never able to repeat his one clinical success; he ultimately became discouraged and did not use the pump oxygenator again.